Alfred Chapman was born Orange in April 1897, the second son of Charles Chapman and his wife Selina Jane (nee Reece). A brother Frank had been born in 1895, a sister Elizabeth (Bessie) followed in 1900. Charles was a member of the Spring Hill pioneer Chapman family, a successful farmer and grazier who designed the local Methodist (now Uniting) Church. Alfred and his siblings attended the Spring Hill Public School and later Alfred farmed the family property of Inglewood. On 8 February 1915 Alf and his cousins, brothers Benjamin Barnett Chapman and George Denis Chapman, enlisted together in Liverpool. When completing their attestation papers all three claimed to be 18 years old. Alfred was, in fact, just 17 years of age, and Ben only 16. The cousins were assigned to 7th Light Horse Regiment, 6th Reinforcements. On 15 June Alf and Ben embarked HMAT A66 Uganda in Sydney. They served on the Gallipoli peninsula from October until the evacuation in December 1915. Alfred was transferred to Maadi in Egypt, where he was appointed a driver. In February 1916 he was marched out to Serapeum, and in July 1916 transferred to the 2nd Light Horse Brigade Machine Gun Squadron at Bir et Maler. In July 1917 Driver Chapman was hospitalised due to septic sores on his leg, apparently the result of a horse bite. He rejoined the Machine Gun Squadron two months later, in September 1917. In November 1917 Alfred’s squadron fought in the Battle of Beersheba and the 3rd Battle of Gaza in Palestine. It was here that Alfred Chapman was killed in action, one of the four men killed that day. According to Ben Chapman they were advancing amid direct enemy fire with less than half a kilometre left to go when Alf, who was riding behind him, went down. George Chapman said that after Alf went down he half rose and waved his hand: “game till the last”. 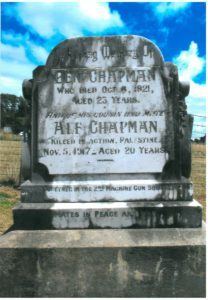 Alfred Chapman is buried in the Beersheba War Cemetery in Israel. In 1921 his parents Charles and Selina took a nine-month long journey during which they attempted to visit their son’s grave. They were unable to due to “the disturbed state of the country”. Alfred Chapman is commemorated on the Spring Hill Public School Honour Roll, the Spring Hill Church Roll of Honor, the Spring Hill Temperance Hall Honor Roll, the World War I Roll of Honour on the southern face of the Orange Cenotaph and on panel number 180 on the Roll of Honour at the Australian War Memorial in Canberra. Alfred is also commemorated on his cousin Benjamin’s headstone in Spring Hill Cemetery, which bears the inscription “Mates in Peace and War”. In 1923 the Anzac Memorial Avenue of trees was planted along Bathurst Road to commemorate fallen WWI soldiers. A tree was planted in honour of “Pte A Chapman”; it was donated by W Marriott. Very few of the trees are still standing today. 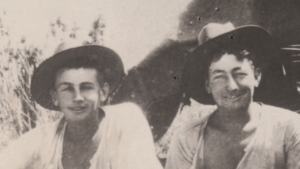 Alfred’s cousins, George and Benjamin both returned to Australia after WWI, George in March 1919 and Ben in August 1919. This entry was posted on November 6th, 2017.